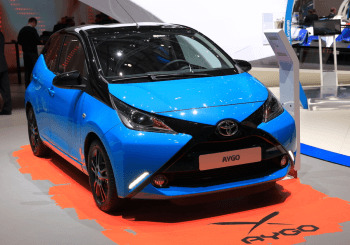 Last month, Toyota launched the new X-Cite version of the Aygo, and now the Japanese manufacturers have introduced an X-Pure version to really set the British summer alight. The X-Cite version comes in a striking design that offers a fun Cyan Splash exterior replacing the old Orange Twist, plus a bit of common sense in the shape of the Toyota Safety Sense. A package that offers a whole host of safety features. The vibrant exterior is joined by piano black touches on the front X graphic and on the rear bumper cleverly coupled with neat elements of bold black too. This is a city car that looks smart on its 15-inch spoked-alloy wheels. They come in black and are topped off nicely with Cyan Splash centre caps. In the UK, you’ll be able to specify a two-colour format that comes with a blacked-out roof and A-pillars plus privacy glass for just another £395. Very striking. There’s yet more Cyan Splash (well, it is a lovely colour) on the air-vent inserts, door panels and carpet mat edging. The instrument panel, gear-level housing and console get the Bold Black treatment. There’s smart use of chrome on the gearstick and interior door handles. Dark-grey seats come with contrasting blue and light-grey seat bolsters. The safety pack offers you Lane Departure Alert (LDA) and the Pre-Crash System (PCS) not to forgetting a high level of equipment that includes; powered door mirrors, height-adjustable driver’s seat, leather steering wheel and gear knob and air-con. Front fogs and daytime running lights are also as standard. The car comes with the x-touch multimedia system that includes satellite navigation, touch-screen functionality, 3D mapping and more. What about the new Toyota Aygo X-Pure? Tapping into the motoring world’s current love of all things white, it comes with White Flash paintwork and white-painted alloys. Finishing the effect off nicely are silver-finished bodywork touches. The interior gets the grey seat fabric, plus bolsters in white and light grey. In terms of technology and spec, the X-Pure matches the X-Cite, minus the two-tone colour package. The X-Pure will be available from August this year. You can have a Toyota Aygo X-Cite or X-Pure from just £11,295 OTR. Both cars come with Toyota’s excellent five-year/100,000-mile warranty. Interested in a Toyota Aygo? If so you can book a test drive with the latest model at our Howards Weston super Mare Toyota dealership.